For something that started out as a microblogging service, Twitter has certainly gone a long way. We could say that it is changing many socio-economic aspects on our society. Do you think I am exaggerating? Then check out the 20 crazy things that already happened on Twitter below. How awkward would it have been if @emilychang had rejected huh? Luckily she didn’t. Unfortunately social networks are not only about good things and joy. A Twitter user named @sandieguy (inactive now) used the tool to let the world know about her suicide plan. Curiously enough the above user sent one of her suicide tweets to Demi Moore. The actress retweeted it to her thousands of followers, and people started calling the San Jose police. The police located the person and took her to the hospital for a psychiatric evaluation. The Brazilian company Tecnisa created a special promotion for social networks, and in June of this year it managed to sell the first apartment ever on Twitter, at a face value of around $250,000. Dell also started using Twitter to promote and sell its products. The campaign has been very successful so far, with over $2 million in sales generated with Twitter exclusive deals. Izea decided to take the whole Twitter marketing thing to the next level and launched a pay per tweet service. Advertisers basically select Twitter users from the Izea market place and pay for tweets that will include a promotional message. 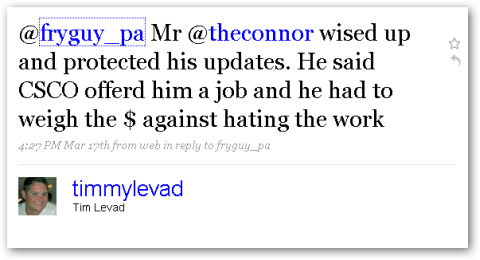 Twitter user @theconnor (private status now) wanted to share with the world how he felt about a job offer…. It turns out that a Cisco employee was following him, and decided to forward his tweet to Cisco’s Human Resources manager. Busted! A company called Redmonk actually made an official job offer to a candidate via Twitter. Luckily this time things worked out fine, and he (@tomraftery) also accepted it via Twitter. Twitpic is a service that allows users to post pictures to Twitter. 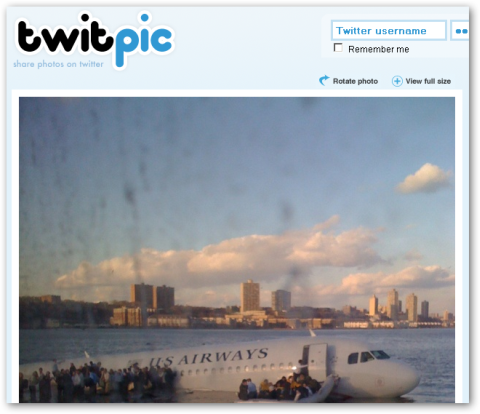 It became famous when a user posted one of the very first pictures of the U.S. Airways accident there. Twitter played a role in Moldova’s protests back in April, as young residents used the service to mobilize gatherings in the “Piata Marii Adunari Nationale” square (they used the hashtag #pman for that). Technology writer Dave Prager decide to use Twitter when he noticed that he had an intruder on his house. Afterward the guy left without causing any problems (yeah, he tweeted about it too). The Phoenix Mars Mission is keeping people updated with its developments via Twitter. Twitter user @abonnen (deleted now) complained about her apartment on Twitter. Property management company Horizon Realty felt damaged and decided to sue her for $50,000. The funny thing is that the Twitter user had only 20 followers, and after the lawsuit the “moldy apartments from Horizon Realty” became famous all over the web. Journalism student James Earl Buck was arrested by Egyptian police for photographing an anti-government demonstration, because apparently the authorities don’t like that kind of thing. He only had time to send one word from his cellphone – “ARRESTED” (you can tell he’s a reporter) – but he couldn’t have got a more effective response if he’d lit up the Bat-Signal. The phone sent the statement to his twitter account, and within hours a worldwide network of friends and colleagues were on the case. He was free the day after. Jay Bushman decided that Twitter could also be used to distribute a book, 140 characters at a time. The title of the book is “Good Captain“, and now it even has its own paperback edition on Amazon. Over the last couple of years the news about earthquakes have almost always emerged on Twitter first, and then on mainstream media websites and publications. We have seen it happen in California, Southeast Asia and Japan. There is even a Twitter account now (@earthquake) dedicated to reporting earthquakes from around the world. Customers of Albion’s Over, a bakery in London, can now be the first to know when a batch of bread is about to get out of the oven. The BakerTweet (how they named the service) also sends alerts about fresh cakes and pastries. Really loved the one about the Hudson River and I followed it live back then. Retweeting this. It’s supposedly this five year old kid twittering, but it’s clearly a fictitious character. That hot bread idea is really GREAT! Wish I could figure out how to automate all the new listings in Naples, Florida!!! The one by Dave Prager is mental, and hard to believe you would spend time tweeting while somebody was potentially taking everything out of your home. ‘After 15 years of blissful happiness I would like to ask for your hand in marriage’ Does this mark the end of blissful happiness. Sorry we English are very cynical. I’m very interested in A suicide note. As social media platforms are becoming increasingly integrated into our daily lives I think tweets like these will become the norm. I’ve already seen more than a few twitter marriage proposals. Wow…very interesting. Out of so many users, it’s not surprising to see some craziness. Due to your collection I was learned about very curious ways if using Twitter! Proposal on twitter…lolz. interesting compilation. Agree with #15 – @shitmydadsays is friggin hilarious. Howdo s*x agencies get on Twitter? Can’tbe a check system. Last one even had filthy avatar-surprised it got through. I have had both genders and am now fed up. I’ve got to say there was some stuff out of Bizarr-o World, yet seems to have some practical purposes as well. Yet, my votes have to go to marston and Suzanne – those were some way to funny tweets going on at those links! The brilliance and creativity that permeates the Inter-webs is truly stunning. Great List! But you forgot the Moonfruit Promotion in June 2009. They managed to promote their brand from low UK awareness into worldwide awareness within the target group with a simple tag promotion. Moonfruit – a simple website creator software – was trending for two weeks and once you wanted to know why, you learned about the product. Probable the best marketing result on twitter so far, even beating Dell’s.